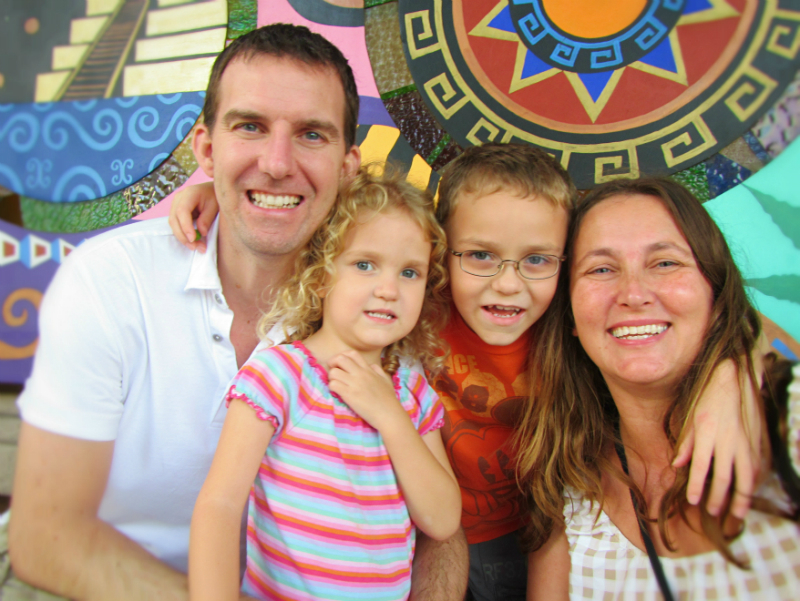 Today, we're talking with a young Canadian couple who travel with their kids! There are several reasons we enjoy their blog, but I think the main thing that attracted us was the helpful tips that they regularly post. Plus, it's fun to read about the interesting things they do with their kids. Like eating stretchy ice cream in Turkey! Stretchy ice cream?? More on that later. So, here we are with Charles and Micki from their travel blog, "The Barefoot Nomad". Kevin and Ruth: We've been reading your blog for a while now, but there's not much mention of your life between that year long adventure in 2003 to when you got married, and the point where the kids came along. Is that because you were just maintaining a "normal" life of working in order to pay the bills? Charles and Micki: In early 2004, towards the end of our first year long RTW trip together, we got married in New Zealand. After a month of lazy beach time in Thailand, we jumped on a plane and came back home to Canada. It was a great ending to a great year and we knew that we would never be the same again. We had caught the travel bug big time and not jumping on the first plane back out was one of the hardest decisions of our lives. For good or bad, Micki and I returned to Canada to try to pursue a "normal" career. To be honest, if we didn't need to replenish our bank accounts all you would have seen would have been our tail lights. We were intrigued about working online however professional travel blogging didn't really exist back then and short of stumbling onto the next Facebook idea, there wasn't a lot of money being generated online by the average person. We were also over the "magical" 30 year old student mark so being able to easily get a working visa in another country wasn't an option without a solid investment or a long term commitment to another country. We had spent the majority of that first year in South East Asia and though we loved it, we wanted something different the next time around. To this day, we still know we'd love to settle somewhere else in the world however we still have too many places to see to lay any permanent roots. One thing we did do at that time was start our own IT company and began working for ourselves. Working on contracts still gave us plenty of leeway and let us take "extended holidays" whenever we wanted. We also used that time to put down a nice deposit on a house in Calgary and do what I refer to as our nesting period. We still traveled however we decided that it was either now or never if we wanted to start a family. Within a short time, our son Cole was born and though we itched to get back on the road, the realities of traveling with a baby just weren't in the cards for us. It wasn't until Cole was two that we sold our house in Calgary and made a solid commitment to traveling again. We spent the next 3 1/2 months in Hong Kong and the Philippines before finding out Micki was pregnant with our daughter Jordan. Decent, free medicare is a wondrous thing in the world so we came back to Canada to have her. This time, we only lasted until she was 1 before jetting off again. The Barefoot Nomad at Roman amphitheater of Hierapolis. Kevin and Ruth: "To this day, we still know we'd love to settle somewhere else in the world however we still have too many places to see to lay any permanent roots." Well, we can sure relate to that! One of the drawbacks in making the choice to do extended travel is that it's often difficult being away from family for long periods of time. We understand that Micki didn't have much in the way of travel experience before you both met, so I'm guessing her parents didn't either. Do they think you're just a little crazy dragging their grandchildren around the world? Or have they taken the opportunity to visit while you're all abroad? Charles and Micki: Micki's parents knew from the moment I met them that travel was important to us as a couple. When we took off for that first year though, everyone thought we were a little nuts. My family included. We were well past that age when the typical backpacker "makes their way" in the world. We both had good jobs with well laid out careers ahead of us. We were also earning a good wage and no one could grasp someone walking away from that. The idea that we would put "real life" on hold to go off gallivanting around the world was hard for them all to understand. Oddly enough, for all the time we've traveled abroad, we've actually never had family visit us outside of Canada. One of the problems is that we have trouble staying still when we travel and practically never spend more than a month in one place. We're also the worst long term planners when it comes to knowing where we'll be in a few months. The vast majority of the time, other people need a few months notice so that they can schedule accordingly. To the dismay of our family, we have a tendency to blow around like the wind. Luckily, we always make it a point to spend as much time with them as we can when we get back to Canada. Right now we're in Alberta for a few weeks spending time with Micki's mom (her dad passed away a few years ago) and after this we're heading to Manitoba to spend a solid month with my family. We may not get to see them as often as we'd like however, all in all, I would say we spend more time with them per year than most families. We also video Skype with them on a regular basis so even though they're not in the same room, our kids and their grandparents get to spend a lot of time together. This year we actually met up with a few friends from Canada while abroad. One met us in Morocco and another couple met us in Spain. It was great to hang out with them in another country. We also flew my mom in to Toronto while we spent the weekend in conference at TBEX (Travel Bloggers Exchange) so it gave her a few solid days of grandchildren spoiling and it gave us the first day off without kids in over 6 months! Kevin and Ruth: How do you decide where to go and what's important? For example, your last big trip brought you to Turkey. What was it about Turkey that attracted you? Charles and Micki: With kids, we're always mindful of safety and routes. We used to think nothing of jumping in the back of some beat up truck and travel through some backwater areas to stay in a cheap hostel for a week or two living on cheese sandwiches and fruit. These days, we have a better grasp on what we can do with the kids and what we can't. Turkey was the last stop on this winters 6 month tour and was someplace we had read about so often in the past few years that we knew it was time to check out. We also knew we were coming back to Canada for the summer so we pushed ourselves harder than usual. After taking a ferry over from Greece we hung out in the beautiful seaside town of Bodrum before jumping on a 5 1/2 hour bus to Pamukkale. The travertine falls and ancient ruins were amazing then we jumped on an 11 hour overnight bus to Goreme to fly over the fairy chimneys in a hot air balloon. That was definitely one of the highlights in my life and something I've seriously wanted to do since I read about it years ago. Turkey was great. The people were super friendly, the locals love children, the country is chock full of history and the food was delicious. They also have stretchy ice cream and we've been known to travel someplace for a lot worse reasons. 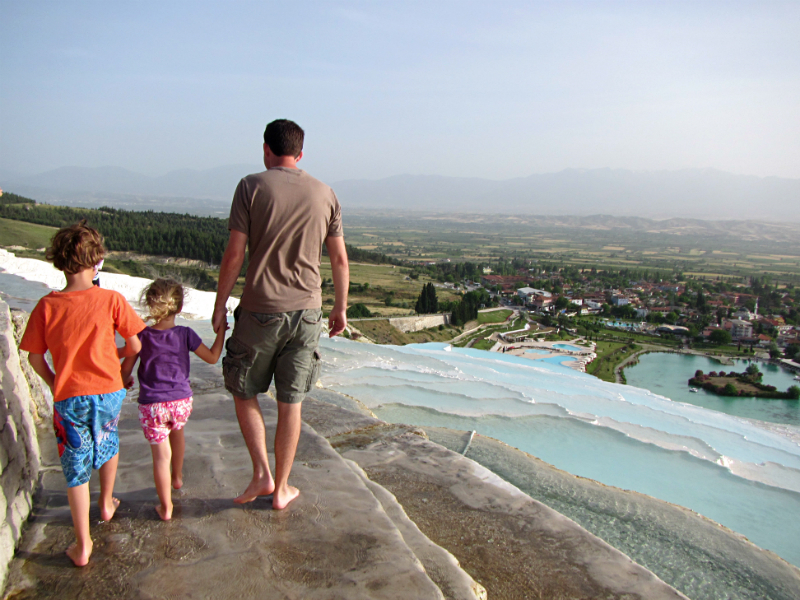 Charles and the Kids Above Pamukkale, Turkey. Kevin and Ruth: Stretchy ice cream??! Charles and Micki: Yeah, ice cream is called "dondurma" in Turkey. It's extremely elastic and resistant to melting. It has salem (a type of flour) and mastic (a resin) that lets it stretch several feet. In Turkey they have tons of ice cream stands and the vendors perform a sort of comedy show as they dispense the ice cream cones. Because the ice cream is so stretchy, they use these long metal poles to scoop it out and then attach the cone directly to the pole. As the customer then reaches for the cone they pull it away or spin it upside down or pretend to drop it. It's quite entertaining and after the kids watched a few videos online of them doing it, they were fully on board to visit Turkey. 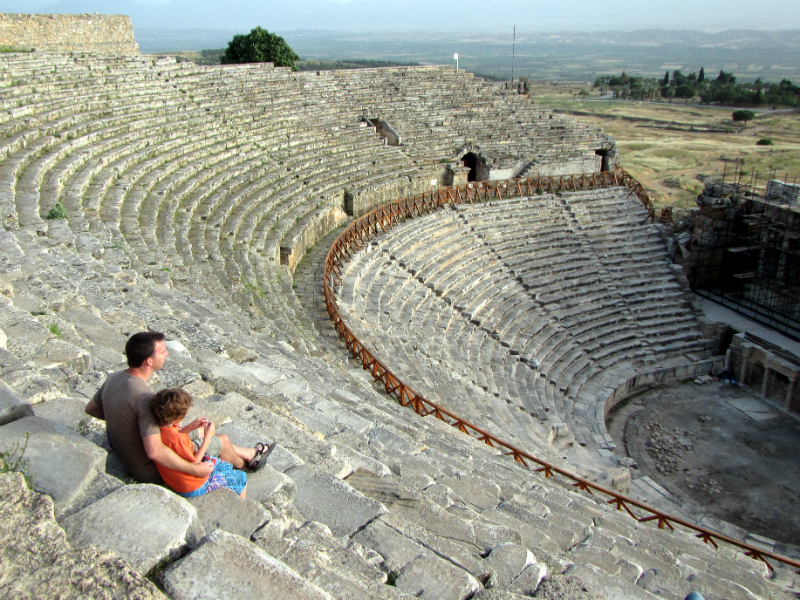 We've found that traveling with kids is so much easier when they're just as eager to see the country as we are. For our family, ice cream is a definite reason to do anything. Kevin and Ruth: Very cool! Okay, on to something else. As you know, one of our travel choices is in a motorhome, and we've met a few other people traveling North America, including Mexico, with children. It would be an easy lifestyle for kids, and a healthy environment from which to home school them while they're young. Any thoughts on doing this as a future extended travel option? Charles and Micki: We've contemplated buying a trailer so many times in the past that it's actually an inside joke between Micki and me. We've never really experienced the east coast of Canada and to be honest besides for Florida we haven't spent a lot of time on the east coast in the States. I've been lucky enough to have traveled up and down the west coast several times and as a kid we would make the 32 hour drive from Winnipeg to the Rio Grande Valley down in Texas near the Mexico border. My grandparents (and now my parents) wintered down there in a RV park every winter so I've seen plenty of Central and Western US. Our biggest problem is that our RV dreams always get pushed back. For whatever reason it never gets beyond our backup plan. Perhaps the unknown mystique of faraway countries beckons us more than what we have in our own backyard. Living in Calgary for 10 years I had easy access to Banff and the Rockies. Growing up in Winnipeg I was a prairie kid. For whatever reason we're always attracted to warm oceans and gorgeous white beaches so heading south someplace warm is always a priority when we take off. I know it's really only a matter of time before we pick something up and go east then south. We spend a good amount of time in Mexico so I could see us following the coast all the way down there. The hardest part at that point would be coming back up and not venturing south through Central and South America. Maybe the reason we don't own an RV yet is just the reality that if we ever started on that journey we might never come back. For travel junkies like us, that might be just too tempting an offer. Kevin and Ruth: We think you should buy an RV! Given that you love Mexico, and the fact that there is so much to explore there, that it would be years before you'd be ready to head further south. If you need any advice, don't hesitate to ask when the time comes! You don't often talk about what's next. We know you're headed to Winnipeg to visit family, but what about after that? Feel like giving Travel with Kevin and Ruth readers a heads up on your next destination, and why you've chosen it? Or if you're undecided, what are the choices you're thinking about? As to our next destination, that's a great mystery. Not only to you and your readers but to us as well. After that month by the lake with my family in Manitoba we're most likely going to head to the Okanagan for a few months. After that we're still unsure. We've been wanting to check out Argentina and Ecuador for the past few years so there's a good chance we'll head that way. We've also been talking about revisiting Thailand and certain areas of Southeast Asia again so there's a chance we do that instead. We also have friends in Dubai who we've promised to visit soon so there's always that possibility and we've been hearing so many great things about Jordan (and their good relations with travel bloggers) so that could happen as well. All I can say for sure is that with us, nothing is ever set in stone and as always, we'll go wherever the wind and our bare feet take us. Charles, Micki, and the kids. Kevin and Ruth: Well, we look forward to finding out what the future holds. We've covered quite a bit here today, Charles and Micki...is there anything else you'd like to add in closing? Charles and Micki: Just that we'd like to thank you guys for the interview and if any of your readers want to see our site and check out what we're up to we can be found at The Barefoot Nomad. If they want, they can also check out our Facebook and Twitter pages where we have a rather alarming tendency to keep up with our travels on a more daily basis. Kevin and Ruth: Thanks for taking the time to talk with us today, it was fun learning more about you! Kevin and Ruth - Thank you so much for introducing us to Charles and Micki and their adorable kids. What a wonderful family way of life! "If I'd only known then what I know now!!!!" I so wish my husband and I had followed our instincts and done so much more travel with our kids. Those children are receiving the most wonderful education and life experiences. Wow! I've subscribed and have already sent their info to my kids and grandkids for their own enlightenment. Thanks again. You are welcome Mary-Pat. We think the same way, we would have loved to have done something like this with our kids when they were younger but we had never known life could be like that. Mind you the computer and internet have certainly made it much easier for a life like that. Thank you for sharing their link with your family. again anothern wonderful interview...such very interesting people. those children will be getting a wonderful education. i really envy them. Fabulous!!! Kevin & Ruth you guys sure know how to pick them :) Thank you! You're welcome Que Vida, so glad you enjoyed it.